The fleet is likely to encounter less sea ice than usual during its voyage. Eight vessels from Russia’s Northern Fleet vessels set sail from the fleet’s main base in Severomorsk on the Kola Peninsula Wednesday heading northeast on a long-distance Arctic voyage, according to the press service of the fleet. “The main goal for the vessels in the Arctic expedition of the Northern Fleet is to ensure safety of maritime navigation and other types of Russia’s maritime economic activity in the Arctic zone,” the announcement reads. The eight ships are the anti-submarine warship Vice Admiral Kulakov, the two landing ships Aleksandr Obrakovsky and Kondopoga, the new icebreaker Ilya Muromets and the support vessels KIL-143, the tanker Sergey Osipov and the rescue tug Pamir. How much sea ice the navy’s new icebreaker will have to crush through is unclear. Earlier this summer, most of the ice seen along the Northern Sea Route was rather slushy and easy to sail through. 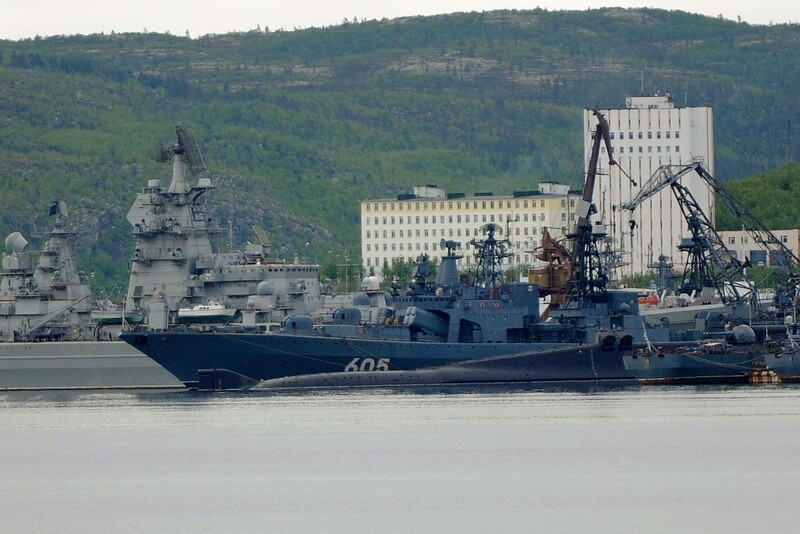 It is not said how far east along the northern coast of Siberia the Northern Fleet navy group will sail this summer. In the East Siberian Seas, according to NSIDC, ice edge remains near average. Last year, the Northern Fleet sailed to the northern port of Dudinka in the Yenisei River where a landing exercise was conducted. Earlier years, the navy sailed all way east to the Arctic Island of Kotelny on the archipelago of the New Siberian Islands. 2018 is the seventh year in a row that the Northern Fleet sails warships along the Northern Sea Route. One of the tasks this year is to train search and rescue and ways to assist commercial ships in emergency situations that might happen in the high Arctic. In support to the ships, two Ka-27 helicopters and one aviation group are deployed to the mission.